The way I feel about kale is right up there with the way George Bush Sr. felt about broccoli. I'm not president of the United States, nor did my mother ever make me eat kale. But I do hate the stinking tough green almost as much as I loathe canned asparagus or … head cheese. If there was an extreme kale shortage in the world, I would be the first to offer up my share of the crop. I say all this because my hatred for certain ingredients does not prevent them from showing up again and again in my Season's Pick box from the co-op. They disappeared happily toward the end of spring, but showed up again, right on schedule, in the last box of September. Rather than stuffing them down the disposal and pretending they were never there (tempting!) I try to prepare kale in new and interesting ways each time it crosses my path. And this is a recipe for all of my fellow kale-haters out there. 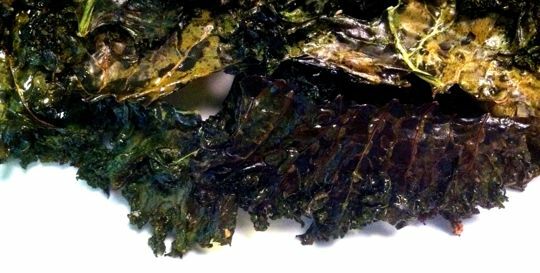 Crunchy, crispy, paper-thin kale with all of the tough, plasticky "ick" factor baked right out. Dipped in a lemony yogurt (or silken tofu) sauce, it makes for a refreshing fall snack, and a healthy alternative to the other crunchy crispy things we normally associate with football season. Kale. It's not just for other people anymore. This is not a make-ahead recipe, but you could prepare the kale up to an hour ahead of time and throw it in the oven 15 minutes before you're ready to serve. Don't skip the dipping sauce; if you're anti-tofu use yogurt! Adapted from this month's issue of Food & Wine magazine. Preheat the oven to 375°. Whisk all but 1 tablespoon of the olive oil and half of the garlic together in a large bowl. Add the kale and toss to evenly coat. Spread the kale in a single layer on 2 baking sheets and roast in the upper and lower thirds of the oven for about 15 minutes, until crisp, switching the position of the pans halfway through. Sprinkle the kale with salt and pepper, allow to cool, and transfer to a large platter. In a small bowl or immersion blender companion container, combine the tofu (or yogurt) with the lemon zest and juice and the remaining garlic and olive oil. Whisk the mixture into submission (or if you have an immersion blender, whazz it into oblivion). Serve with the roasted kale.